The parliamentary “ping-pong” process is in full swing and the Immigration Bill returns to the Lords today at 3pm, after it was debated in the Commons last night. You can read the transcript from the 9th May Immigration Bill debate at the Commons here. (Strangely) There was no vote on the Ramsbotham amendment, and the result of the vote on the pregnancy amendment was 296 – 258. Both detention amendments, as explained below, are back at the Lords. Please keep the pressure up for the Ramsbotham amendment. Please also see the list of motions here. A big thank you to everyone who has been lobbying MPs to support the Lord Ramsbotham amendment – we are now seeing its impact. The Government is feeling the pressure of the enormous disquiet from MPs, the House of Lords and the campaigners and has now published a ‘compromise’ amendment to the controversial judicial oversight clause that can leaves people in administrative incarceration for six months with not judicial oversight at all. The new amendment, published late last night, reduces the length of time before automatic bail hearings of people in detention take place from six months of detention to four months of detention. However, this ‘compromise’ amendment does nothing to address the serious misgivings highlighted in our briefing paper, in particular, the key thrust of both the Parliamentary Inquiry into the Use of Immigration Detention and the Shaw Review that the UK detains far too many people far too long and that the UK must immediately stop the practice of using detention as a norm rather than as an exception. So please continue to lobby your MPs not to accept this ‘compromise’ amendment and instead to support the Ramsbotham amendment, as explained below. This is not the same as a time limit on detention we would like to see as a first step in meaningful detention reform project, but we need to get all we can get from this Immigration Bill. Thank you. This is a quick summary of where things stand with the Immigration Bill in relation to immigration detention, as it returns to the Commons on Monday 9 May 2016. Here’s a document which shows which amendments the Lords are sending back to the Commons and why. With David Cameron’s announcement today that the Government will not oppose what has come to be known as the Dubs amendment (Lords amendment 87: Unaccompanied refugee children: relocation and support), only two issues of contention remain to be resolved next week, which will require the votes of MPs. They are the detention of pregnant women and judicial oversight. The fact that so much of the Immigration Bill has been about immigration detention shows how far we have come, in terms of communicating, campaigning, advocacy and lobbying. Our work is far from over, and when this “ping-pong” stage comes to an end, we will need to take stock of what we have achieved but also how we will continue to work towards our goal. 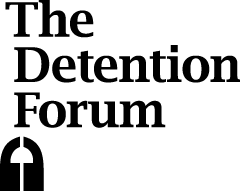 For the 9th May, the Detention Forum is focussing on judicial oversight amendment. It is important that MPs are informed and encouraged to support Lord Ramsbotham’s amendment (Amendment 84), which provides far greater scrutiny over the Home Office’s power to detain than the Government has been willing to agree to so far. After the Government has had to back down on the Dubs amendment, they are unlikely to want to face another defeat. Therefore, it is crucial that we apply as much pressure as possible on the Government to hammer in the message that we need a radical reform of detention, not a meaningless gesture just to appease us. The Government has already tried to water down the Ramsbotham amendment, by offering their own amendment, which would implement automatic bail hearings for those who have not applied for bail for six months. The Lords voted down the Government amendment and sent back the Ramsbotham amendment to the Commons, reasoning that this is unsatisfactory. The Detention Forum’s briefing here explains why we support the Ramsbotham amendment. 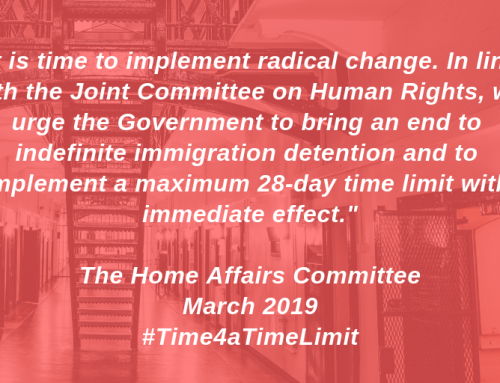 Even thought this falls short of a time limit of 28 days that we are advocating for, we welcome an attempt to instil a new practice within the Home Office where any detention beyond 28 days must be authorised by the First-Tier Tribunal. 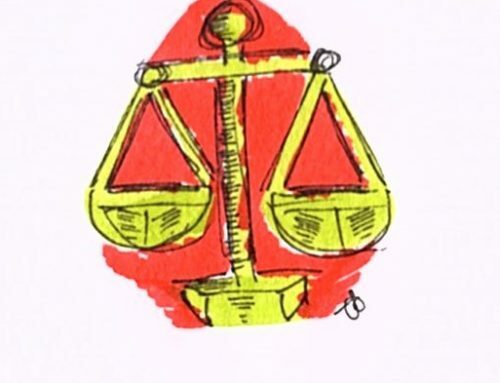 This creates a new norm that detention beyond 28 days must be exceptional and requires a judicial oversight; and this introduction of judicial oversight is, in itself, quite significant in the UK context. The Ramsbotham amendment reflects a cross-party concern at the over-use of detention expressed both by the Parliamentary Inquiry into the Use of Immigration Detention and the Shaw Review. Given that the vast majority of individuals held in immigration detention do make bail applications within six months of being detained, the Government amendment would only benefit a small number of individuals. Those who might benefit are likely to be the ones who are extremely vulnerable. While the Government might insist that their new ‘adults at risk’ policy would prevent detention of such individuals, given the Government’s poor record of preventing detention of vulnerable pepole, we believe it is highly inappropriate for the Government to suggest that such people can be left in detention for six months without judicial oversight. Therefore, we urge MPs to support the Ramsbotham amendment. 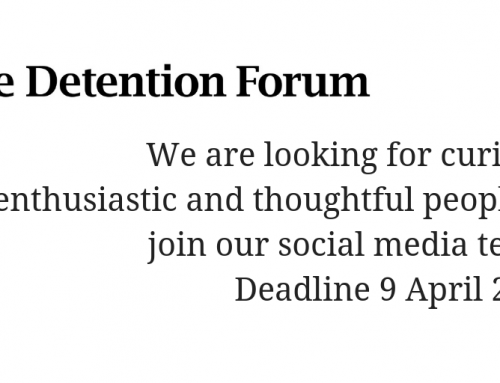 The Government amendment will do very little to change the UK culture of detention. You might like to consider emailing or tweeting your MPs to let your view known. When the Commons defeated the Ramsbotham amendment, it was defeated by 36 votes. The Government might offer some sort of compromise before 9th May, in order to avoid another vote. We expect the Government’s new amendment to be made public late tomorrow (Thursday 5 May). There might a feeling among supporters that, after the Dubs amendment concession, there is nothing left to do with the Immigration Bill. That is far from the truth and we would be grateful if you can continue to encourage your supporters and others to lobby their MPs. You can read other organisations’ blogs as well, which provide more background information.